MD Clean offers professional window, facade and uPVC cleaning services that adhere to the Health and Safety Working at Height Regulations. We have put several safety initiatives in place, which ensure that every window cleaner on our team is completely safe, whilst on the job. Our trained and experienced team uses the latest water purification techniques and pole cleaning systems to access hard-to-reach areas with ease. Additionally, we also use cherry pickers, cradles, traditional ladders, safety harnesses and other cleaning methods. From residential complexes to corporate buildings, we have the expertise to do a quality job. Irrespective of the size of the structure, we can access most areas in a planned and controlled manner. MD Clean would be pleased to offer window cleaning services as a part of an on-going contract or on an order-basis. We will complete your project in an effective and on-time manner whilst ensuring top quality. Our services are affordably priced to match your budget. Professional, trained and efficient staff that adhere to health and safety best practices to ensure minimal risk. Latest window cleaning equipment which will comfortably clean high windows and hard-reach-areas. 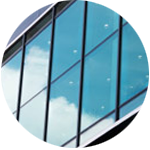 Contact us today to find out how we can help with your commercial window cleaning requirements.